In a recent blog to coincide with Cadel Evans' Tour de France win, I wrote about other Australians to have ridden the Tour de France, among them Sir Hubert Opperman, or 'Oppy', as he was known Down Under. (Evans, thanks to the genius of his parents, must be one of, oh, I don't know, maybe 10 or 12 Australians to have made it through puberty without acquiring a nickname ending in 'y' or 'ie' – his nickname is apparently 'Cuddles'). Anyway, since my original Oppy blog, I've caught up with Stephen Hodge, the man responsible for preserving Opperman's unique Tour de France images as part of the Cycling History Collection. Hodge, who rode the Tour de France six times and represented Australia at World Championship and Olympic level, is now a cycling administrator and sits on the board of Cycling Australia. (There's a great article about him on Cycling Tips.) He was a diffucult man to pin down as Evans rode into Paris – here's what he had to say about the Opperman collection. Can you tell me more about what motivated you to buy the Opperman Tour de France collection? I was told about an imminent auction of the last effects of the estate of Sir Hubert Opperman in Sydney. 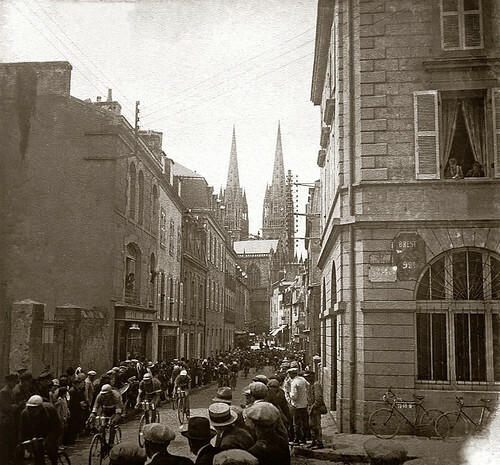 There were several collections of old photos, some of his original cycling licenses and many other personal effects. The collection I was interested in was by far the best lot in the auction, but I didn’t think I could buy it on my own and I expected fierce bidding. I contacted a couple of my cycling mates and we agreed to pool our resources for one of the sets of photos, not thinking we would secure this fabulous collection of images. At the time they were advertised as photos from the 1928 Tour, but as we did our research on the photos later, it became clear the images were from 1930, not a year in which Oppy rode. I missed out on every other affordable collection and had given up hope of buying anything. When the bidding started on this lot, I waited to see what would happen. Bidding was subdued, so when it slowed, I came in and went really hard, leaving no time between bids. This clearly psyched out the other bidder who was on the phone, and I managed to get the collection for around the reserve price. What was the collection worth when you bought it? The cost of the collection has ended up being just a small part of the money we have put into preserving, scanning and getting them to the large format limited editions they are now. So from a cost of just a few thousand dollars, our investment is now a lot more than we ever thought we were going to spend. But what a fantastic hobby! We love the photos and have many of them hanging on our own walls. We are a bit of a joke amongst our friends because we also give them to cycling mates for special occasions. How difficult has it been to restore the images? We spent a lot of time and effort preserving the glass ‘lanterns’, which are positive images that were generally used for projection in the first half of the 1900s. One of Australia’s foremost conservationists, Kim Morris, preserved and cleaned the 44 slides, some of which had suffered extensive damage. Kim is well known for his work at the National Library of Australia. Once he had done his work, we picked the best images and handed them over to an expert in digitisation to get them scanned at high resolution. Following a career making water-guilded frames for artist Brett Whiteley, Brett Lichtenstein of Digital Art Directory had transferred his skills into digital art and had recently digitised the entire collection of the National Gallery of Australia. We were lucky to find Brett and he scanned 23 of the best images at 2400dpi. This started a long process of deciding how much we wanted to digitally ‘clean up’ the scratches and stains on the slides and also what size and format we wanted to produce the final images in. It took several years between our normal working lives, but we are very happy with how authentic they still look. The large format where each image is close to 60cm square looks fabulous. They are really unique. How did you go about captioning them and identifying riders and places in the photos? 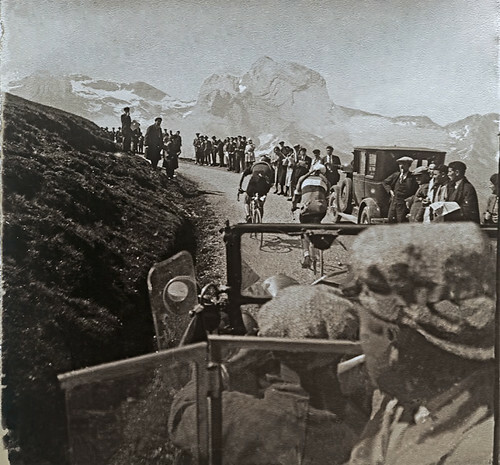 We have done extensive research on all the images to determine who the riders are and where they were taken, but we still don’t know who they all are or where some of the photos were taken. The website Memoire du cyclisme has been a great resource and we have contributed to their group to help maintain the website. The principle strategies we have used to identify riders and stages is by elimination, looking at the numbers that are visible and cross-referencing with stage results and team lists. But if anyone sees a mistake or a new detail, please let us know. And you think Opperman used the photos to fund his team's Tour de France campaigns? Well, this is a theory of ours. 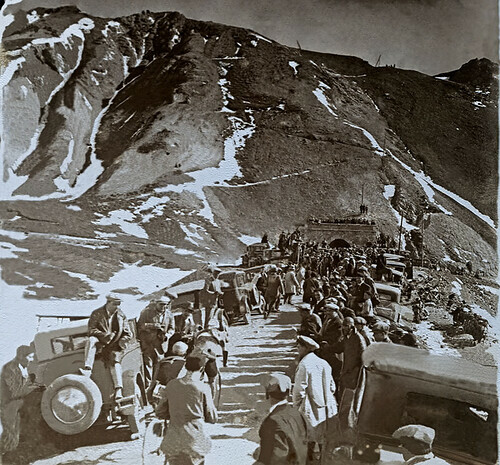 We wondered why Oppy would have a collection of photos of what are clearly some of the star riders and the key moments in the 1930 Tour when he didn’t ride that year himself. But he did ride the following year. It took weeks to sail from Australia to Europe in those days, and such a major voyage would have been very expensive to fund, not to mention lost wages from any jobs the boys had back in Australia. So we surmised that Oppy, as team leader, must have done a lot of fundraising for the 1930 Tour team’s campaign. The glass lanterns would have been ideal to illustrate a town hall talk or community meeting to raise money. But this is all just a theory of ours. Australia has a rich history in the TdF - probably no surprise given it's renowned as a sporting nation. Don Kirkman and Snowy Munro rode the Tour way back in 1914. There was no SBS in those days, no internet or 24-hour news – what do you think inspired the likes of Kirkman and Munro, and later Opperman, to make that long and expensive voyage to Europe? Well, Oppy clearly had a talent for endurance cycling, holding many long distance records in Australia. In those days professional sport was also one of the few ways that someone with limited means could make their fame and fortune, and Oppy certainly did that in Europe. Much like today’s talented cyclists who see Cadel Evans become a superstar in cycling, I'm sure much the same attraction existed for Aussies back in the 1900s. One reason I think Australian cyclists do so well in Europe is precisely because it IS so far away; if you are prepared to travel that far to give it a go, you are certainly going to give it a really good try once you get there. 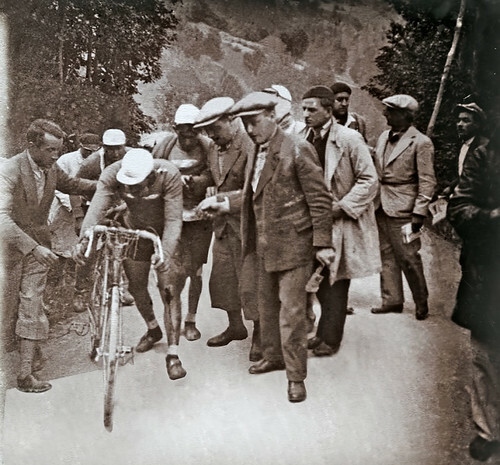 Opperman's exploits are probably appreciated more outside of Australia than in it – particularly in France where some cycling fans regard him as the greatest ever. He should be regarded in the same league as Bradman, yet he's little known outside cycling circles in Australia (maybe even better known for his post-cycling career in politics). Is he the forgotten hero of Australian sport? Oppy is certainly fairly unknown here in Australia, even by our cyclists. Many of those early cyclists are not at all known, but that is another reason why we love the photos we bought back in 2005 – they connect us to the amazing history of our Australian champions in cycling. Close to Flying, the Cadel Evans' autobiography. Robbie McEwen's autobiography is out in October but early birds can pre-order it now. For anyone interested in the history of Britons at the Tour de France history, see William Fotheringham's Roule Britannia and Graeme Fife's Brian Robinson: Pioneer. Irish cycling fans should look to Shay Elliott: The Life and Death of Ireland's First Yellow Jersey. See also our list of must-read Tour de France books.